I’ve been saving these titles up all year for this, like the enormous book nerd I am. Here are eight picture books that I absolutely love – they include very simple books, slightly more text-heavy titles, fiction and non-fiction, silly, and sweet. Not a Stick by Antoinette Portis. Oh, this book is great – Ella loved this one and the companion book, Not a Box, where a little animal keeps saying “this is not a stick!” and then showing the reader what it is. From a sword to a paintbrush to a fire hose, it’s just so fun to see what imaginative uses for a basic object the author comes up with. Out of Sight by Francesco Pittau and Bernadette Gervais. This is probably Ella’s favorite book of 2012 and it has taken all my willpower to not share it before now. Each page has a large number of flaps and shows some bit of each animal underneath (on one page feet, on another noses, on another the hides of the animals). Ella loved guessing which animal she’d see when we opened each flap and I loved the bit of trivia about the animal printed on the backside of each flap. Also, this book is very large, which makes it even more fun. Nighttime Ninja by Barbara DaCosta and Ed Young. pjs, makes me happy every time. Green by Laura Vaccaro Seeger. I am in love with this book (which is getting a lot of Caldecott buzz). More Bears by Kenn Nesbitt and Troy Cummings. Ralphie showed me this book early in the summer, and we read it over and over again. The poor author is trying to write a story (which has no bears) and an offstage voice keeps demanding bears. At last he relents and puts in a single bear, but that just encourages the voices which continue to call for more and more bears. A Bargain for Frances by Russell Hoban and Lillian Hoban. I love all the Frances books, but this one is my absolute favorite. Thelma, the tricky friend, fools Frances in to buying an inferior tea set, but Frances uses her own scheme to get back at Thelma. When I read this one aloud in my elementary schools, I almost couldn’t keep my laughter under control. Wave by Suzy Lee. I love a wordless picture book, and this one doesn’t disappoint. 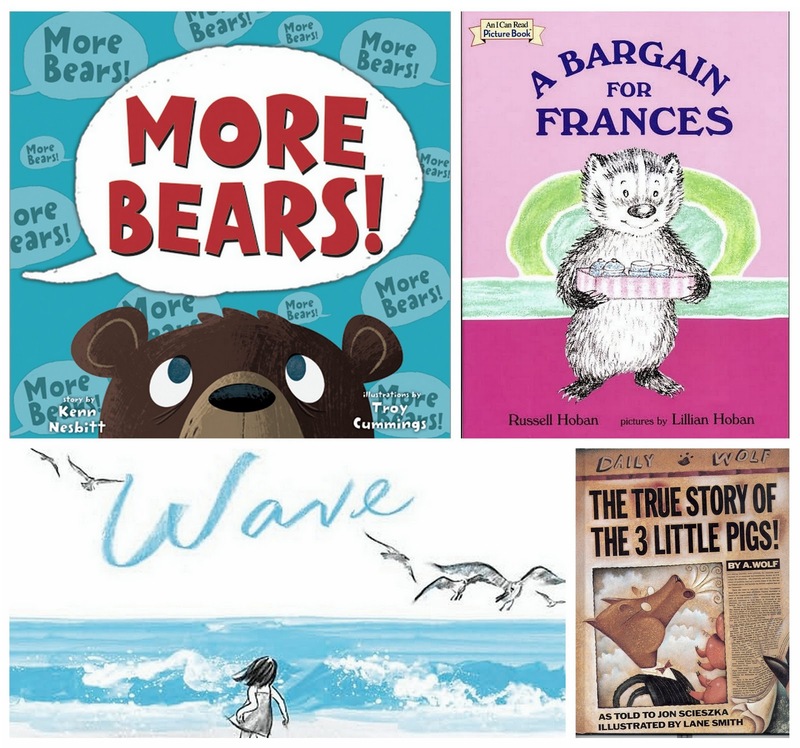 It’s a gorgeous three-color story of a little girl going to the ocean. At first she’s a little timid, but she gains confidence as she gets closer to the real waves. Brief and sweet. The True Story of the 3 Little Pigs by Jon Scieszka and Lane Smith. One of my childhood favorites, I love this classic story told from the wolf’s point of view. It’s amazing how quickly you can be persuaded by someone who admits to eating two pigs. Still looking for more ideas? 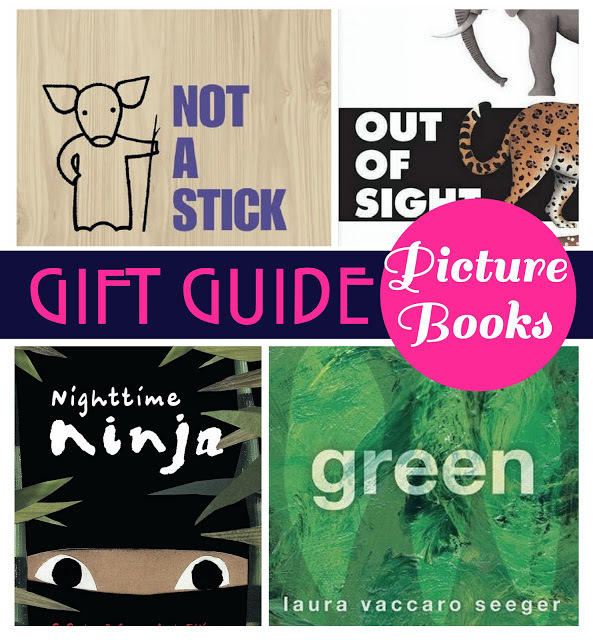 Here’s last year’s picture book gift guide and all the picture books I’ve reviewed over the last couple of years. Oh, Frances! Love her. But my favorite is Bread and Jam for Frances, just because of her awesome friend Albert. His egg salad sandwich! The doily! The pickle! Coming out even! I just love it. The true story of the three little pigs and the stinky cheeseman were my FAVORITE books growing up. I'd always insist on these when going to the library. And of course, all the Frances books were bomb. We have two of my youngest nephews in the family gift exchange this year. I am excited to look through these books when we are Christmas shopping. Thank you! My 2.5 year old loves Not a Stick as well and 'reads' along every time. We also have Not a Box and it is equally loved. A Frances book??? NOOOOOO! I despise the France TV show (have you read Nurtureshock? it does everything that books says TV shows should not do). I assumed that the books were the same? But I strongly disagree with reading kids books that introduce negative behaviors to them (like constantly bugging mom and dad when mom and dad are trying to go to sleep). I'm excited to try out the rest! Have you read This is Not My Hat ? I bought it as a Christmas gift and loved it!